Last week, they finished filming the pilot episode and started production on the next one. Also, we got some more promo and lots and lots of set pictures! Another Shooting Day in "Hotlanta"
Executive Producer Peter Lenkov announced on Instagram on July 25 that he was back in Atlanta to resume filming of the pilot episode. He was greeted with "Welcome back to Hotlanta!". We had already heard at ComicCon that Lucas Till had been a real trooper while shooting for the pilot episode on a hot tarmac in his leather jacket without complaining. It seemed the weather conditions were still quite challenging while the crew was filming downtown. Lenkov posted a picture of his "sweating jeans" while Lucas shared a picture of George Eads wearing a so-called "cold scarf". It's unclear if Vinnie Jones - who had tweeted being back on set earlier - had also gotten one of those. On the same day, stuntman Aden Stay shared a picture from the set right before getting ready for action. Bypassers were excited to see the production going on; e.g. while filming near Cafe Lucia or at the Georgian Terrace Hotel. On July 26, CBS released a "Sneak Peak" (sic!) 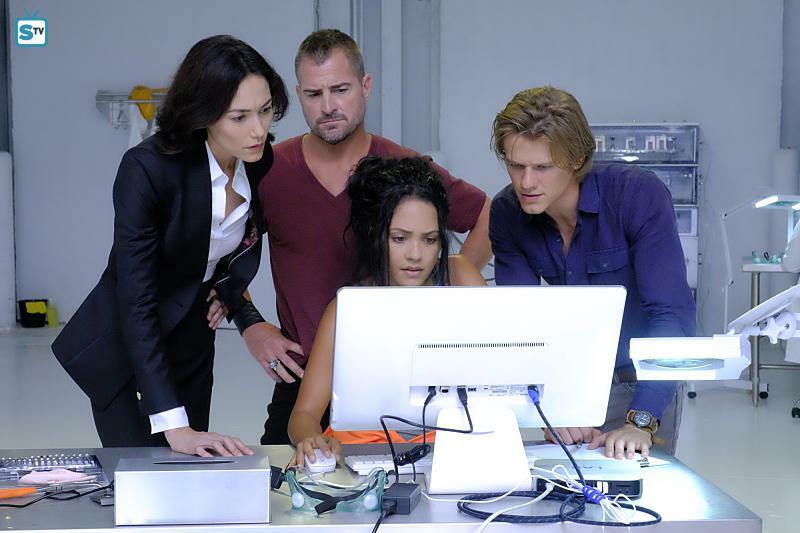 of the pilot episode with comments by Peter Lenkov, Lucas Till, George Eads and Stunt Coordinator Jeff Wolfe. We can taste the action alright; e.g. 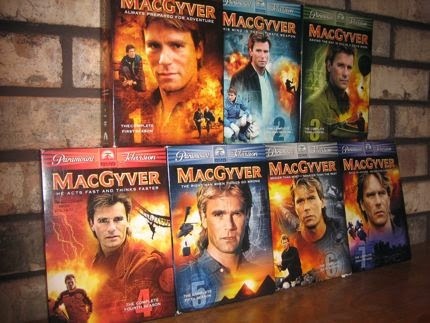 MacGyver chasing after an airplane, fighting bad guys and getting ready to do some MacGyverisms. Shortly after, they added a 10-second-TV-ad for the premiere. 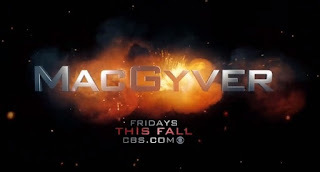 They made a modern version of the title in front of an explosion, and it looks surprisingly good (although us "old" fans still wonder about getting the old theme along the new opening credits). On the same day, we got several promo stills for the Pilot Episode by SpoilerTV. 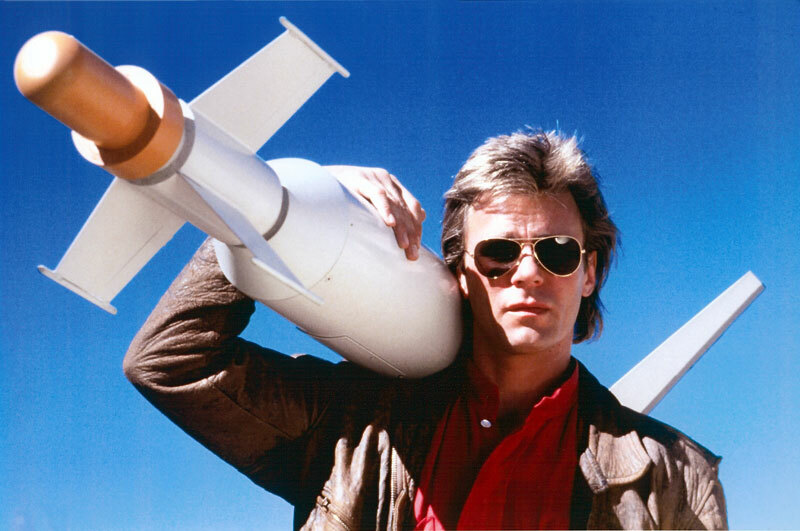 Every MacGyver Fan knows the iconic picture of MacGyver shouldering a missile - and maybe even non-fans do (this is probably one of the most often used stills of the original show). Peter Lenkov shared a very interesting picture on July 26 of himself on the interior set, shouldering a white missile with a red nose while wearing sunglasses. Even more interestingly, he later deleted the picture. Did Lenkov give too much away about what the team had in mind for the next promo shot? It's no secret: What you post on social media will make the rounds, even if you try to make it disappear. The cat was already out of the bag, so maybe that's the reason that only two days later, several other crew and cast members posted pictures of themselves or of Lucas with the prop; e.g. Producer Michael Clear, Justin Hires or Camera Operator Tiko Pavoni. Peter Lenkov posted a short video where we get to see Lucas on the monitor, carrying the missile trough the forest (jungle?). His t-shirt indicates that MacGyver went to MIT (Massachusetts Institute of Technology). We got lots of new pictures of the interior sets for the rest of the week. Justin Hires announced his first day working on set on July 26. Lucas Till posted a picture of Justin and one of George Eads plucking at a guitar. Justin in turn had posted several videos on his Facebook Account. Lenkov showed us Lucas getting touched up by the MakeUp Departement before sharing several pictures of (presumably) MacGyver's home; e.g. the living room, the fridge and the work area. It's fun to see pictures even though you're not really sure what to make of it; e.g. of MacGyver with a Robot Hand or of Wilt Bozer making waffles. Also, the crew shot some scenes in "Siberia". Must be pretty funny; filming in full winter gear inside a studio in Hotlanta under bright lights (ahem). Several Extras shared their involvement in the reboot; Katy Harrington (hotel guest), Jonathan Fritschi, Kevin Pinkney or Gary Sonny Alfano (drug dealer). StandIn James Grabowski revealed with his call sheet of the pilot episode that this was going to be an "open-flame-kind-of-hot-day" on set. On the same day the crew was filming in "Siberia", a husky was at the studio. It's unclear for now if the dog will be part of this scene or not. On July 27, MacGyver CBS officially introduced Tristin Mays as the character of computer hacker Riley Davis. On the same day, Lucas Till shared a picture of him with his Stunt Double Chris Brewster. Fans had already recognized her on a picture provided by Peter Lenkov. On July 28, TVLine confirmed that Amy Acker is guest-starring on the second episode. She will play a CIA operative working undercover in Caracas who got kidnapped. Of course, we can expect Mac and Jack to get her out; maybe even get the girl AND the missile. 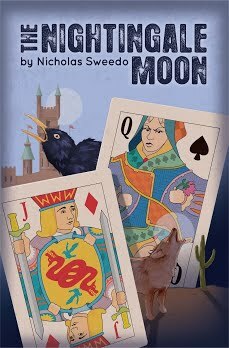 To the disappointment of many fans (myself included), it doesn't look like Richard Dean Anderson will be part of the reboot. In a statement through his website on July 25, RDA said that he's "(...) not considering being a part of a project that has overlooked the insanely LOYAL FANS of the original character and has proceeded without considering how and why they all became and STAYED loyal fans...(...)". We will see if he still feels that way after the first few episodes have aired. From what I've seen of the production and heard and read of the panel and interview roundtables at ComicCon, it seems like this time around the crew actually tries to honor the original show. On July 27, Peter Lenkov informed via Instagram that they have started production on Episode 1x02 before wrapping the pilot episode on July 28. According to SpoilerTV, the second episode is called "Metal Saw". An important tool on MacGyver's SAK, maybe? The locations look pretty interesting. Also, Lenkov showed us how MacGyver would bulletproof a car. If I was sitting in this car, I would feel safer already. Maybe. There are quite some more episodes to film until December and the crew was in for another night shoot on July 29. But they still have fun on set between takes. Tracy Spiridakos showed us what happens when you forget your phone at a table full of stunt men. Thanks Andrea! Lots to digest here. I like hearing about some of the international locations -- that's one difference between this show and Five-0 (even though Five-0 does have an occasional episode where they go to another country, it's mostly in Hawaii). And I'm glad that they're bringing in a computer expert -- while MacGyver was always good with computers in the original, I think it's smart for them to let him focus on the MacGyverisms and leave the computer heavy lifting to someone else. I saw a Hallmark Channel movie with Amy Acker a while back and liked her in it. And I like the shot of MacGyver's house, even though the fridge has some references to alcoholic beverages which the original MacGyver didn't partake in. As for RDA, it's too bad that it came to this since his harsh response doesn't benefit him or the show. I don't blame him for not wanting to participate, but his tone comes off as unnecessarily bitter and out of touch, especially considering all that Peter Lenkov has done to try and pay homage to the original. I've heard offline that the situation from his point of view is "more complicated" but I don't know any more details. Hopefully they can work something out and at least have a good relationship even if he's not on the show. Very unusual for a series to film in Georgia. I'm also intrigued to hear about the international locations...I just hope they aren't badly CGIed. Amy Acker was a recurring character who played "bad girls" in both "Alias" and "Person of Interest". Wouldn't doubt if she plays a villain on "MacGyver" too because she makes a good one. Her character in that Hallmark Channel movie makes it hard for me to envision her as a villain but I guess that's what acting's all about. Also I wonder if the still with RDA holding the missile was taken during filming for "Ugly Duckling." That's my best guess (if there even is an episode that it comes from) since that one dealt with a missile and his clothing matches. It's also interesting to note that in the deleted picture by Peter Lenkov, there are several yellow rubber duckies on a table right next to him - which made fans speculate about a possible easter egg (the shot taken from the episode "Ugly Duckling") AND a possible involvement by RDA (he seems to like yellow rubber duckies). Interesting, I didn't know that RDA was a rubber ducky fan. I guess they needed more rubber duckies to get him on board! I'd say it's a safe bet the shot came from "Ugly Duckling".